Artificial Intelligence and Machine Learning are two hot buzzwords at the present time and are often used interchangeably. There has been a lot of confusion about these two and most people still refer Artificial Intelligence and Machine Learning as equivalent words and use them reciprocally, while others utilize them as discrete. The technology has revolutionized the way decisions are made and it becomes important for all the businesses as well individuals to be clear about what these terms mean. Let’s understand the difference between these two terms in detail. According to the father of Artificial Intelligence, John McCarthy, “Artificial Intelligence is the science and engineering of making intelligent machines, especially intelligent computer programs. Artificial Intelligence is related to the similar task of using computers to understand human intelligence, but AI does not have to confine itself to methods that are biologically observable.” This definition explains perfectly what Artificial Intelligence is. A lot of people think that Artificial Intelligence is a system but, it is not a system rather it is implemented in the system. Artificial Intelligence is all around us and being a conglomeration of concepts and technology, it has different meanings for different people- self-driving cars, voice assistants, robots impersonating humans, hands- free devices turning the lights on and off or toasting the bread, flying drones circling the skies and much more. Artificial Intelligence has different benefits for individuals and businesses. It has made easy the lives of people by automating maximum tasks which are an essential part of daily routine. Whereas, it has enabled the businesses to make decisions with precision by providing deep and detailed insights of the customers sitting online as well as competitors’ market presence. Machine learning is a subset of Artificial Intelligence or it can also be said a technique for realizing AI. It is the learning process by which the machines can learn on their own without being programmed. This application of AI not only allows the machines to learn on their own but also provides the system ability to improve itself from past experiences. Tools which we use every day have Machine Learning incorporated to provide an enhanced customer experience. Amazon, Netflix also used ML to give recommendations on what to purchase and watch respectively. Machine Learning is currently the most promising tool of AI for businesses. Artificial Intelligence or AI is the capability of the machines to imitate intelligent human behavior and then sense, reason and act on its own. Machine Learning or ML is the process of empowering the computer systems with the ability to learn and improve their performance on being exposed to more data over time. The main target of AI is to increase the chances of success in every situation and not accuracy. The main target of ML is to increase accuracy while missing out sometimes on bringing out success. Artificial Intelligence is capable of decision making on its own. Machine Learning does not make decisions rather focus on learning new things from data with the passage of time. Artificial Intelligence leads to the development of systems which mimic humans in responding and behaving in certain situations. Machine Learning does not enable a system to mimic human behavior. It creates self-learning algorithms for the machines. Artificial Intelligence will always find an optimal solution for a problem. Machine Learning will find a solution for a problem not paying attention to whether it is optimal or not. Artificial Intelligence works like a computer program that does smart work. Machine Learning is the process in which a machine accepts a set of data explicitly and learns from that data. The main goal of Artificial Intelligence is to simulate natural intelligence to solve complex problems. 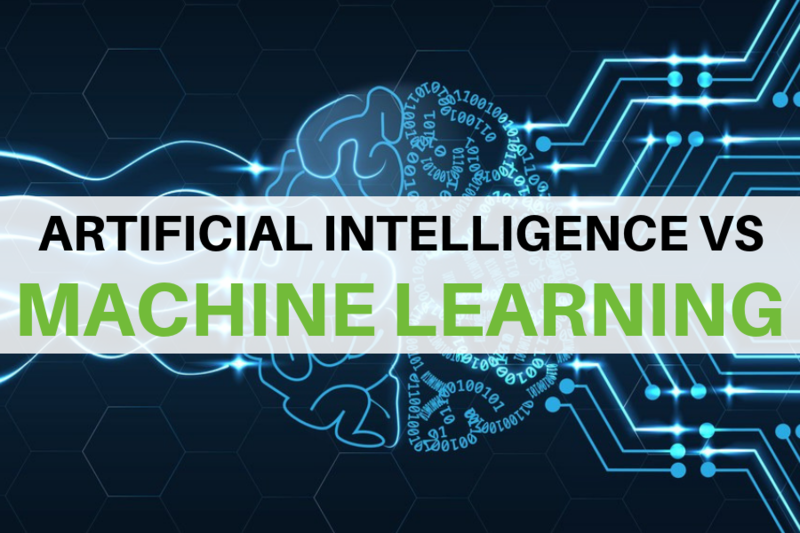 The main goal of Machine Learning is to learn from the data related to a certain task to maximize the performance of the machine on that particular task. Artificial Intelligence needs Machine Learning to reflect and optimize decisions. Machine Learning is a subset of Artificial Intelligence. Artificial Intelligence can never be counted as Machine Learning. All Machine Learning is counted as Artificial Intelligence. Artificial Intelligence finally leads to intelligence or wisdom. Whereas, Machine Learning leads to knowledge. Artificial Intelligence and Machine Learning have been actively used by major industries like healthcare & fitness, financial trading, sales and marketing, Security, and much more and these industries have benefitted a lot form this technology. With huge strides in AI, the technology is poised to revolutionize businesses globally. It is believed that in the coming future, there will be some sort of algorithm involved in almost all the decisions to be made- big or small and it will be interesting to see how the companies use this technology to take the business to a new level and cater to the demands of their existing and potential customers. Are you Committing these 8 Major SEO Mistakes in E-commerce?